It can be a tricky thing breaking into the world of heralded animation, but if you can't beat 'em, copy 'em. This seems to be the thought process over at Phase 4 Films, a company currently being called out by Disney over promotion of their latest release Frozen Land. 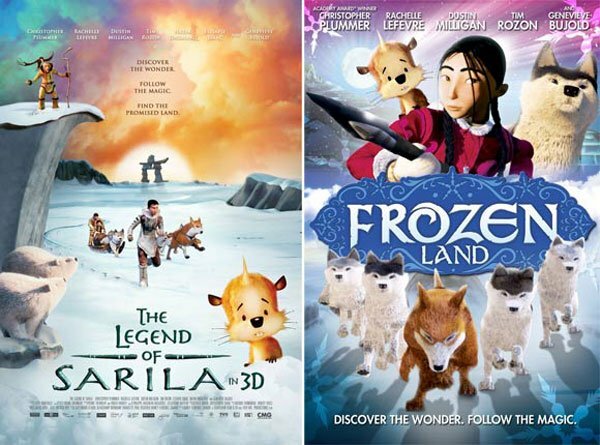 THR reports the official complaint points out that Frozen Land opened less than three weeks ahead of Disney's Frozen, but notably at that time it was called The Legend of Sarila. With that name, this Phase 4 feature barely made a blip at the box office, so time to rebrand, right? Cartoon Brew shows the previous poster, and the new one, which boasts a logo strikingly similar to that of Disney's newest princess venture. Disney is suing over what they (and really anyone with eyes) see to be a blatant mimicking of their brand. Should a judge see their point, this means Phase 4 Films would be in violation of the Lanham Act, which is meant to prevent people from purposely perplexing the public of a product's origin to sell its goods. Basically, if Disney can prove people might see Frozen Land because they assume it is or is associated with Frozen, Phase 4 would owe Disney for damages, lost profits, and be forced to destroy all DVDs that bare the name Frozen Land. "As is apparent from the face of the FROZEN LAND logo, despite the infinite options available to it, Phase 4 intended its logo to replicate the FROZEN Trademark Logo of Disney's FROZEN. For example, the FROZEN Land logo also includes jagged, uneven edges on the lettering, dramatic flourishes on the letters, and an elongated R and Z that cradle a stylized O that curves into itself and does not close entirely. In addition, the word 'frozen' is significantly larger than the word 'land.' The two logos are nearly identical." Notably, Warner Bros. fought (and won) a similar case last year when one opportunistic mockbuster-maker Asylum attempted to release Age of the Hobbits as The Hobbit: An Unexpected Journey readied for its debut.